The account of Robert Kelynge, the bailiff of Sutton, for the year 1433 survives in the Stratford upon Avon Record Office. He recorded all the income and expenditure for the year for the Lord of the Manor, who was Richard Beauchamp, Earl of Warwick. One of the headings in the account is Manorial income, that is, for the demesne property directly owned by the lord of the manor. This shows that the Manor House was then untenanted, the dovecote was totally broken down and destroyed by crows, weasels and pine martens, and reduced to nothing by rain and wind and other storms. The bailiff drew up his account by copying out the previous year’s account and noting any differences. The account for the year 1480 refers to the dovecote in exactly the same terms as the 1433 account, so there is no knowing how many times it had been copied - it may have first appeared in the account over 100 years previously. Robert Kelynge records no income from the manorial vaccarium (dairy farm) because it was no longer in existence, but this also could have been copied out over a hundred times. Another dairy farm, Le Newshippen, comes under the heading of Manorial income. This new dairy farm no doubt replaced the old vaccarium, so if its origin could be dated, this would also give a date for the abandonment of the vaccarium. The account describes Le Newshippen (New Shipton) as a farm of 160 acres, with no mention of any farmhouse or other building. However, a barn at New Shipton is one of the oldest buildings in Sutton, and a recent archaeological study of the building showed that the massive timbers used in its structure were from trees felled in 1425. The tenant of New Shipton in 1433 was John Verney, and this was the thirteenth year of his lease, so this takes us back to 1420, when the trees used for the barn were still growing. Perhaps the barn replaced an older one, once again raising the possibility that New Shipton originated in the thirteenth century. One theory is that the Manor was reorganised in about 1215, the manorial woods which occupied the eastern slopes of the E Brook valley making way for a new Sutton headquarters for the Earl (New Hall), a new dairy farm (New Shipton), and a new deer park at Echelhurst. New Shipton Farm was redeveloped for housing some years ago, but some of the older buildings were converted rather than destroyed, and the 1425 barn is now business premises, many of the original features being preserved. Entrance to the property, which used to be from Walmley Road, is now from Wylde Green Road. 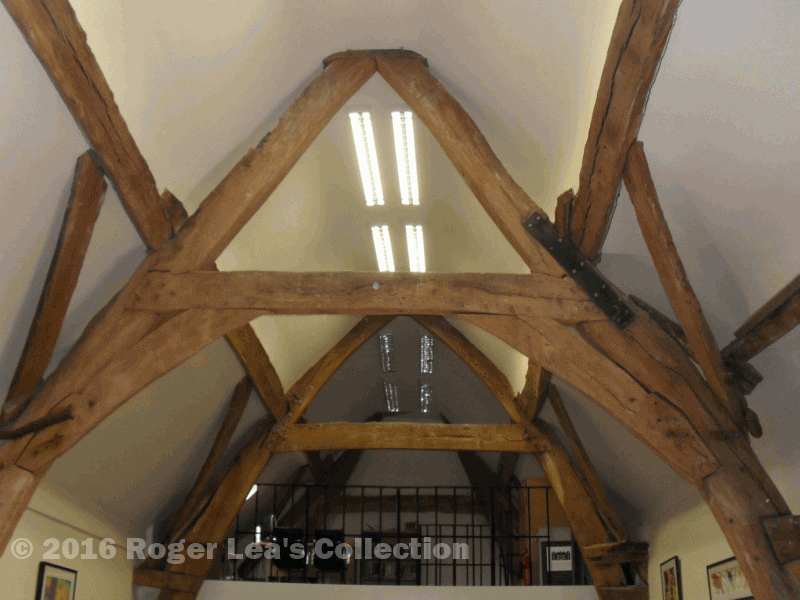 This photo, taken on 26th July 2011, when the restored New Shipton Barn was in use as a showroom, shows three of the massive cruck trusses, each formed from two halves of a specially trained oak tree. The nearest one has its tie beam and wind-braces in place, but needed strengthening where the longitudinal timber (purlin) was jointed in.